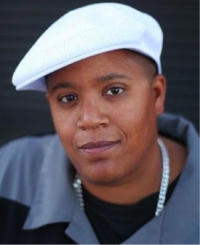 Malkia Cyril is an San Francisco California activist. She was married to Alana Devich Cyril who died in 2018..
"My mother was a NY black panther and educator. She taught me early that cultural change precedes and foments political change. It was in the light of her love and leadership that I grew as a poet, as writer, as a community organizer, and as a communications strategist, and it is in the shadow of her passing on that I continue her legacy with open arms, and an open heart." Endorsers of the project included Malkia Cyril, We Interrupt This Message . In 2008 Malkia Cyril, Center for Media Justice, Oakland, CA signed an online petition “A Open Letter to Barack Obama on Iran”. Media Action Grassroots Network staff and board convening! — with Karlos Gauna Schmieder, Nick Szuberla, Steven Renderos, Jen Soriano, Malkia Cyril, Amy Sonnie, Alison Roh Park, Betty Yu, Oshen Rose and Brandi Collins. Malkia Cyril is a consultant with RoadMap, a Freedom Road Socialist Organization affiliated consultancy group . Those invited, on Facebook included Malkia Cyril. This page was last modified on 1 December 2018, at 15:50.